The unfortunate thing about food trends is that inevitably they flame out and then people avoid that ingredient because they don’t want to seem passe. Bacon definitely had its ridiculous moment in the sun – bacon beer, bacon gum, bacon donuts and so on. Why mess with something that in its most natural form is pretty awesome!?!?! Using bacon as a bit ingredient and not as the star is how I like to use it most. Chefs have been using bacon for ages to impart fat and flavor to sauces, soups, stews and braised dishes all without you knowing about it. So when I read in Cook’s Illustrated that they used bacon to solve the common dilemma of dried out grilled chicken I was very intrigued. They extolled the virtues of a bacon paste slathered over the chicken before it hit the grill. Not only does the bacon flavor the chicken but its fat helps baste the chicken while it is cooking with no additional work from the grill master. Genius! If you are worried about turning a healthy grilled chicken breast gluttonous, there are only 2 pieces of bacon used per 2 pounds of chicken and most of the fat cooks off while it’s grilling. 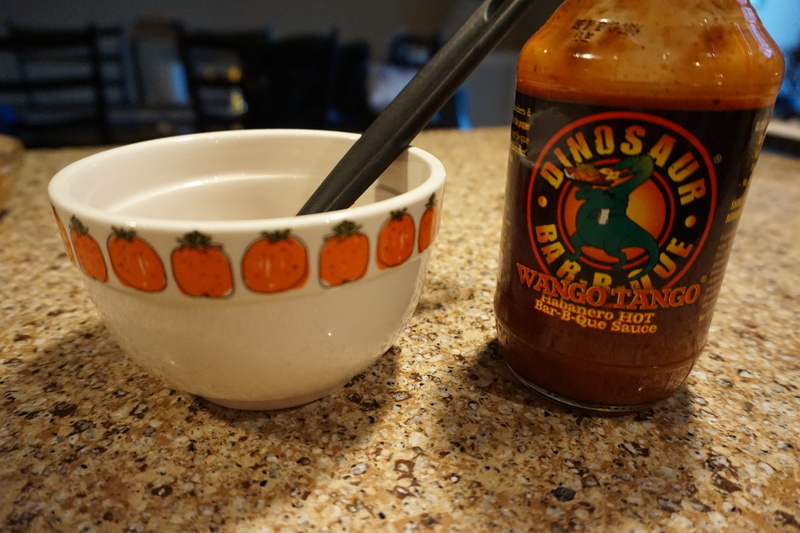 Of course the magazine says to make your own BBQ sauce but for me jarred sauces (especially the ones from Dinosaur BBQ) are way better than anything I can make myself. The key to the bacon paste is to really let the food processor do its job, you cannot over puree the bacon. Match this with the coleslaw and mac and cheese from earlier this week and you will have a stress free labor day menu. If you are looking for a dessert to make I am going to try my hand at this icebox cake by Ina Garten – haven’t made it before so I can’t vouch for it 100% but how bad could mocha whipped cream and chocolate chip cookies be? I hope everyone has a great long weekend – its been an incredible summer, cooking, entertaining and blogging along the way. I am excited to share with you my fall and football favorites starting next week. Please make sure to reach out if there is anything you would like to see on the blog and as always please pass along A Capitol Contessa to friends and family who you think might enjoy it. Just this week we hit over a thousand visitors and over 50 posts which is so gratifying – thanks to everyone for their support! 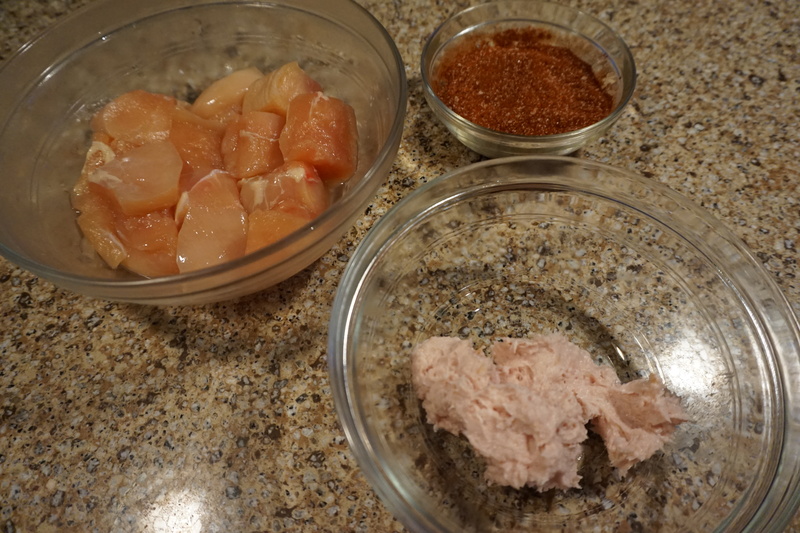 Toss the chicken in a bowl with the salt, cover ad refrigerate for at least 30 minutes up to a couple of hours. This will help season the chicken. Pat the chicken dry once it has hung out with the salt with paper towels. Put the bacon into the food processor and process for 30 seconds to a minute until its formed a smooth pink paste (bacon paste!). Add the bacon paste to the chicken. Mix up the paprikas and sugar and add to the bowl or if you have a spice rub that you like use that instead. Mush them all together so the chicken ends up coated with the bacon paste and spices. 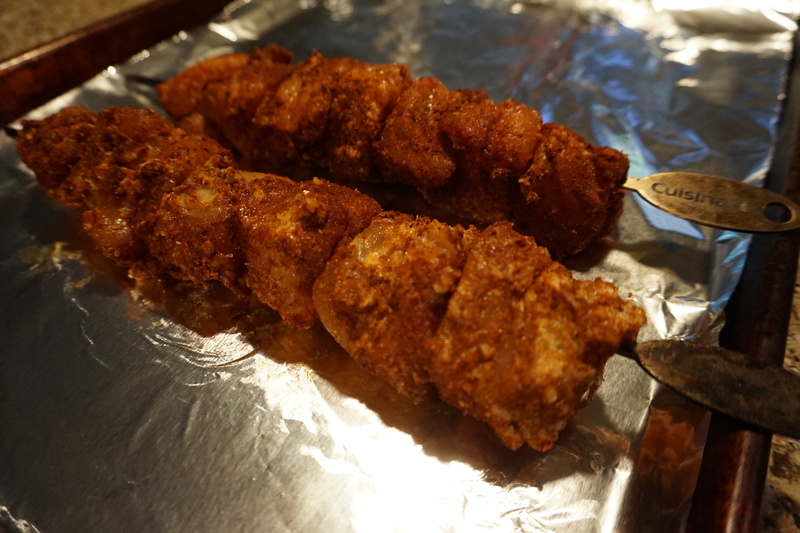 Put the chicken on metal skewers or wooden ones that have been soaked for at least 30 minutes in water. Put the chicken on fairly tightly with little to no space between the pieces so they all cook evenly. Preheat your grill on high then cook the skewers over medium high heat for about 8 minutes, turning them every 2 minutes or so. You want to get nice color on all sides. After 8 minutes begin brushing the skewers with the BBQ sauce – brush one side, cook for a minute, then flip and brush the other side and cook for a minute more. Remove the chicken from the grill and cover them with tin foil to let them rest for 5 minutes. Serve with additional sauce if you would like. Toss the chicken in a bowl with the salt, cover ad refrigerate for at least 30 minutes up to a couple of hours. Pat the chicken dry once it has hung out with the salt with paper towels. Put the bacon into the food processor and process for 30 seconds to a minute until its formed a smooth paste. Add the bacon paste to the chicken. Mix up the paprikas and sugar and add to the bowl or if you have a spice rub that you like use that instead. Mush them all together so the chicken ends up coated with the bacon paste and spices. Put the chicken on metal skewers or wooden ones that have been soaked for at least 30 minutes in water. Put the chicken on fairly tightly with little to no space between the pieces so they all cook evenly. Preheat your grill on high then cook the skewers over medium high heat for about 8 minutes, turning them every 2 minutes or so. You want to get nice color on all sides. After 8 minutes begin brushing the skewers with the BBQ sauce – brush one side, cook for a minute, then flip and brush the other side and cook for a minute more. Remove the chicken from the grill and cover them with tin foil to let them rest for 5 minutes. Serve with additional sauce if you would like. Made a large batch of Bacon BBQ Chicken this weekend with the idea that I would have some left over for my lunches this week. There was barely enough left this morning for lunch today. Excellent recipe and I’ve already shared it with some friends. Making more tonight. This Looks awesome what a great way to serve chicken!